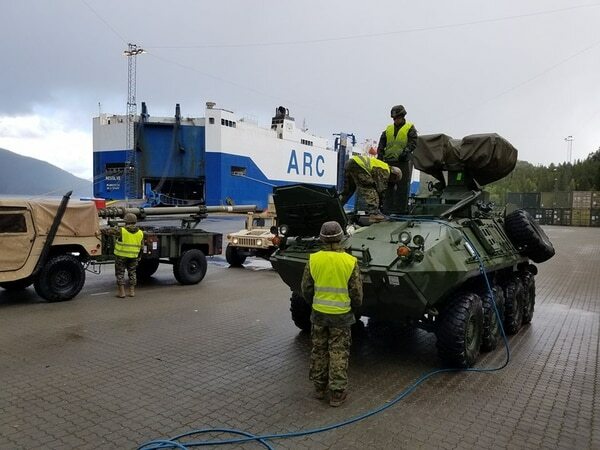 Nearly 2,000 Marines and sailors will be headed to Norway to participate in one of NATO’s largest military exercises in more than a decade, dubbed Trident Juncture. The Marines and sailors are part of the 24th Marine Expeditionary, or MEU, and they already have started embarking equipment, trucks and armored vehicles aboard U.S. ships in preparation for the NATO training evolution slated to kick off at the end of October. This year’s much touted Trident Juncture exercise will feature amphibious landing, cold-weather training, surface assault, aerial assault and sustainment operations, according to Capt. Clayton Groover, a spokesman for the 24th MEU. And embarked with II Marine Expeditionary Force, or II MEF, for the NATO exercise is a newly upgraded anti-tank variant of the Corps’ Light Armored Vehicle, or LAV-AT. 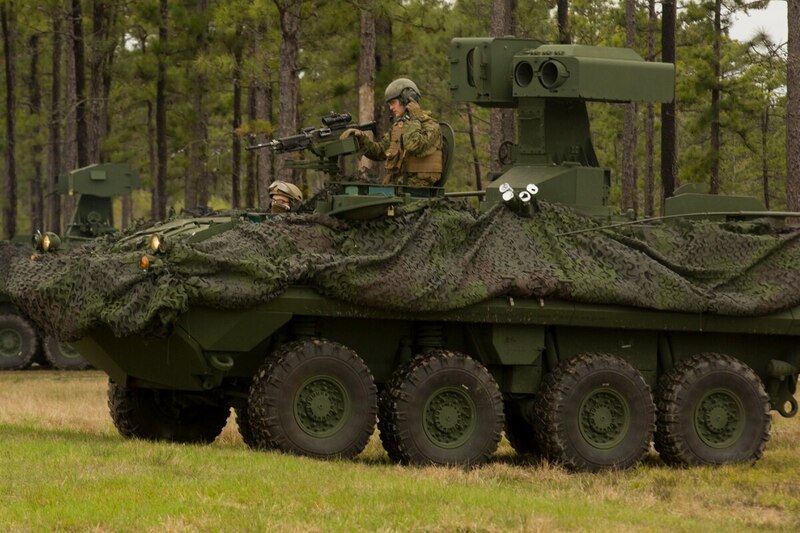 It’s a new anti-tank version of one of the Corps’ oldest armored vehicles in the fleet, and boasts a new turret system equipped with tube-launched, optically-tracked, wire-guided, or TOW, missiles. The new weapon system operates much like the Common Remotely Operated Weapon Station, which allows operators to engage targets unmanned and from safety within the confines of the vehicle. The Corps just started pushing these new upgraded LAVs to fleet last September when four of the LAV-ATs made their way to 1st Light Armored Reconnaissance Battalion Marines at Camp Pendleton, California. The upgraded weapon system for the LAV will boost survivability for the aging vehicle as the Corps faces down near-peer rivals and competitors packing a sophisticated array of tanks and armored vehicles. Photos posted to the 24th MEU’s Facebook page shows the new LAV-AT with II MEF being offloaded for Trident Juncture. The Marines of the 24th MEU, which includes 2nd Battalion, 2nd Marines, Combat Logistics Battalion 24, and assets from Marine Aircraft Group 29, will not be the only Marines in country when Trident Juncture kicks off. Already on the ground in Norway as of the beginning of October are nearly 700 Marines with 3rd Battalion, 8th Marines. It’s the largest yet deployment by the Marines as part of the Corps’ six-month training rotation to the Arctic country. The arrival of the new expanded Marine rotation and the current ongoing preparations for Trident Juncture was decried as irresponsible and saber-rattling by Russia. “We have to state that such irresponsible actions will inevitably destabilize the military and political situation in the north, increase tensions and undermine the foundations of Russian-Norwegian relations. All these NATO preparations cannot be ignored, and the Russian Federation will take the necessary reciprocal measures to ensure its own security,” Russian Foreign Ministry spokeswoman Maria Zakharova said in response to questions posed by Russia’s state controlled TASS News Agency, about NATO’s increased footprint in Norway. “From our side we are confident that the Arctic and northern Europe must remain a low-tension zone. Reckless saber-rattling in this previously calm region can have far-reaching consequences, and not through any fault of ours,” she added. Nearly 40,000 troops from dozens of NATO and allied countries are expected to participate in Trident Juncture. "The multilateral exercise provides the 24th MEU with the opportunity to exercise their amphibious and expeditionary capabilities in a unique environment in support of partner nations,” Clayton told Marine Corps Times in an emailed statement.